This stunning A-line knee-length skirt will flatter any figure. The delicate floral pattern has pretty pops of yellow & navy, and it's perfectly set off by the gray background. Flat waist in front with elastic just along the back to ensure the perfect fit. 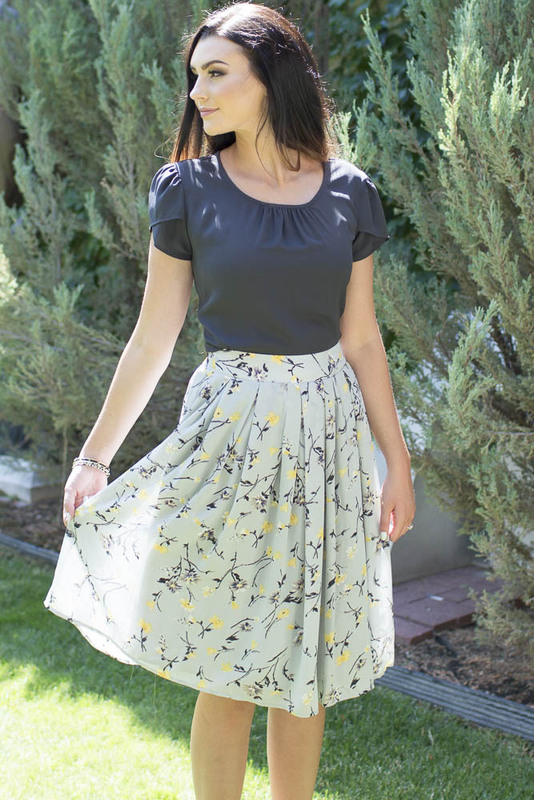 Side pockets, pretty pleats and the full, flowing design make this skirt simply beautiful! Worn here with our Chiffon Top in Dark Gray and our Drape Chiffon Top in Ivory. Lengths: XS-S 23.5", M-L 24", XL-2XL 25.5"